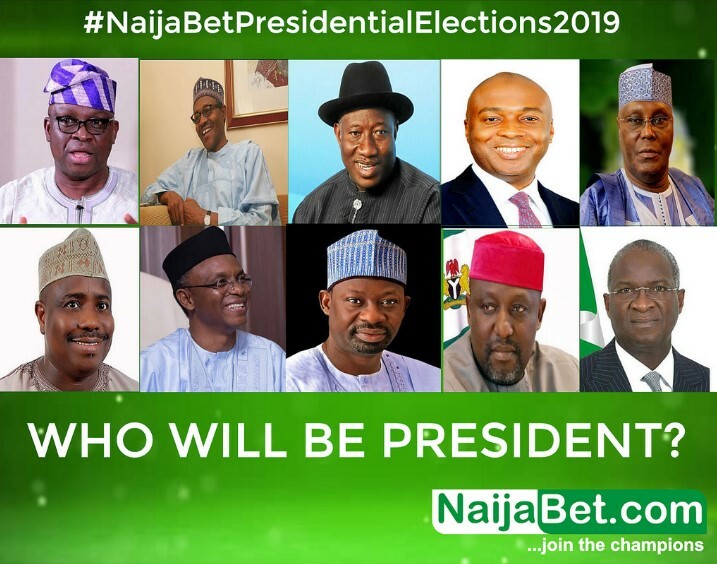 The last general elections witnessed a high level of participation by NaijaBet.com users predicting who will win the Presidential Elections, various amounts were won by over a thousand winners who predicted correctly Muhammadu Buhari’s victory over the then incumbent President. The highest winner went home with the sum of #2.65 million. The stakes are high again, with the Presidential Election scheduled for 16th February 2019. NaijaBet.com this time has increased its offerings by making available various betting options beyond just who will emerge as President. The options available includes Which Party Will Emerge victorious at the various States Gubernatorial Elections. In August to be precise NaijaBet.com made the headlines for its bet options on “How soon will Buhari Return”, different users of the website went home with various amounts of money for predicting correctly the arrival of the President in the 3rd Week of August, which carried an odd of 1.20. A list 27 Potential Presidential Aspirants have been drawn up to lock horns in February 2019 election. Interestingly Vice President Professor Yemi Osinbajo, former Commander-in-Chief, Goodluck Jonathan, ex-Vice President, Atiku Abubakar and current Senate President, Senator Bukola Saraki top the list of aspirants to be President of the world’s most populous black country, whose citizenry are yet to feel the dividends of ‘CHANGE’ Democracy. Africa’s richest man and business mogul, Aliko Dangote, current APC’s National Leader, Bola Ahmed Tinubu, former Presidential flag-bearer of then Action Congress of Nigeria (ACN) and ex-Chairman of the Economic and Financial Crimes Commission (EFCC), Nuhu Ribadu, Peoples Democratic Party (PDP) National Chairman Ahmed Makarfi, six presently serving State Governors and three ex-Governors as well as one serving Minister are also on the list. Nasir El-Rufai-Kaduna State whose birthday is on February 16, the Election date leads the list of Governor-to-be-President, followed by Aminu Masari-Katsina State, Ayo Fayose-Ekiti State, Rochas Okorocha-Imo State, Ibrahim Dankwambo-Gombe State, Aminu Tambuwal-Sokoto State and Kashim Shettima-Borno State. Minister for Power, Works and Housing, Babatunde Fashola, former Senate President, Ken Nnamani, Senator Murray Bruce and Mr Sam Nda-Isaiah, a former presidential aspirant on the platform of the All Progressives Congress (APC) are on the list too. Only two women, made the list. They are Oluremi Comfort Sonaiya, a politician and educationalist, and was Nigeria’s only female presidential candidate in the 2015 general election under KOWA Party and #BringBackOurGirl campaigner, Oby Ezekwesili. Finally, the duo of Bala Abdulkadir Mohammed, a former Senator and Minister of FCT (Federal Capital Territory) in the Jonathan administration and Engineer Martin Onovo (MNSE) an oil and gas Engineering Consultant and Energy Expert completes the list. Good day, thank you for the inquiry. An email has been sent to you via [email protected]. It contains the procedures on how to register and play the online game. How do I bet online, without having to go to business center? How will l bet and when will politics bet start? how will l play this presidential election?